Hubei is a central Chinese province; rather like neighboring Henan it marks the transition from mountains in the West to low fertile coastal plain in the East. The name Hubei comes from its location north of Dongting Lake. It is dominated by the Yangzi River (or Chang Jiang) that forms many low lying lakes and reservoirs (the largest number in China) as well as the world famous Three Gorges ➚ (now harnessed by the huge Sanxia Daba dam ➚). Qutang, Wuxia and Xiling are the names of the gorges that are spread out over 120 miles [193 kms] in order west to east (but the first two are in neighboring Chongqing province). Many of the sites along the river have been drowned by the rise in water level associated with the Three Gorges dam. Wuxia gorge is marked by towering mountains on either side of the river making it seem a chasm. The ancient ‘hanging coffins’ of the Bo people ➚ can still be seen along the river and Su Shi, the great Song poet wrote eloquently about the gorges. The gorges took a heavy toll in people and boats over the centuries; so it is welcome that this big hazard has now been removed. 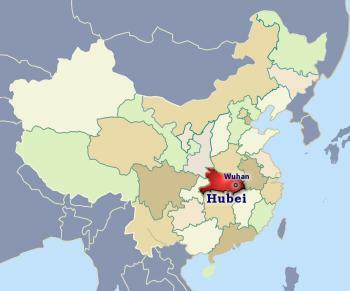 Hubei was the heart of the Chu kingdom during the Warring States period of Chinese history. Qu Yuan, the earliest acclaimed Chinese poet lived in Hubei at that time. Overlooking Fancheng District from Xiangcheng District on the other side of the Han River, which is a tributary of the Yangtze River. October 2011. 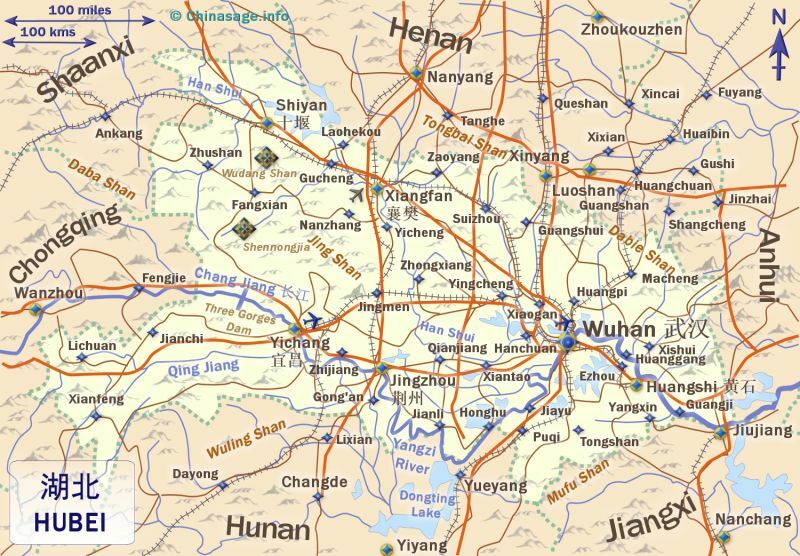 Wuhan is the largest city in Hubei, it was formed in 1926 by combining three neighboring cities Hankou, Wuchang and Hanyang together. Wuhan stands at the confluence with another significant Chinese river the ‘Han’ 汉水 hàn shuǐ, it also has the main railway line from Beijing to Guangzhou running through the city. Wuchang was one time capital of the state of Wu in the Warring States period and stands on the southern bank of the river. Hankou became a major river port on the Yangzi when, after the first Opium War, trade opened to foreign powers (including the British; French; German; Russian and Japanese). The Yangzi is so broad and deep that large ocean going ships could sail up the river and dock at the city. Some buildings near the city center show this foreign influence. Hankou used to be known as the ‘Street of a thousand shops’. Temple of poet and minister Qu Yuan at Yichang, Hubei Province. The Wuhan area suffered severe damage in the last century: in 1911 with the fall of the Qing and later in 1923 and then 1937 with the Japanese occupation. The Wuchang Uprising of 1911 led by Sun Yatsen marked the start of the revolution that created the Republic of China and it is commemorated there. It was in the late 1930s the defacto capital of unoccupied China. The Changjiang Daqiao ➚ was the first bridge over the lower Yangzi built 1955-57 and opened up the area to development. A second bridge was completed in 1995 and there is now also a tunnel. It was at Wuhan that Mao Zedong made his famous swim of the Yangzi in 1956 and again in 1966. Since then the city has become heavily industrialized. The provincial museum at Wuhan is one of the best in China with many exhibits from the Warring States and Three Kingdoms periods. Wuhan’s Fengdu Ghost City ➚ is a more unusual tourist attraction. Donghu (East Lake) is an attractive park east of the center of Wuhan; it has over 70 pavilions, towers and gardens. On the north east shore is a pavilion dedicated to the memory of the poet Qu Yuan. Near the bridge in Wuchang is the Huanghelou ➚ Yellow Crane Tower standing on the She Shang hill dating back over 1,700 years. A story relates that an immortal came down and drank wine at a shop and painted a yellow crane with orange peel. The lifelike image attracted many visitors until sometime later the immortal returned to fly off on the crane. The present tower has recently been rebuilt several times on the original site, the last time in 1884. The Buddhist Guiyuansi ‘Temple of Original Purity ➚’ has over 54 thousand volumes of ancient sacred texts and hundreds of images of ‘arhats’ - Buddhist saints. The ancient 古琴台 Gǔ qín tái 'Guqin Platform' in Hanyang district commemorates the friendship of the musician Yu Boya and Zhong Zhiqi back in the Warring States period. Much of Wuhan city is modern; ferries run upstream on the Yangzi via the ancient city of Yichang through the gorges to Chongqing. Shengnongjia ➚ is a notable National Forest in the mountainous north-west. The reserve has many rare plants; trees and animals (including the Golden Monkey, Golden Pheasant and Giant Salamander). The Wudang ➚ mountains are famous for Daoist temples going back to the Tang dynasty scattered among the mountains and gave rise to the Wudangquan ➚/Taijiquan (Taichi) martial art tradition. It is set in a botanically rich area. Wuhan, from the Yellow Crane Tower. October 2005. 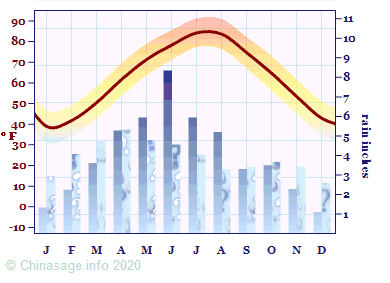 Hubei has hot, humid summers and cool, dry winters. Wuhan is one of the ‘three furnaces’ of China in summer with temperatures over 104 ° F [40 ° C] combined with high humidity. Agriculturally it lies on the dividing line of wheat growing in the north to rice growing in the south but it also grows a great many other crops including bamboo; Yichang black tea; Enshi green tea and sesame seeds. Industry is centered on the Wuhan area. The province produces some oil to add to China’s sources of energy. Citation information for this page : Chinasage, 'Hubei Province, central China', last updated 26 Nov 2018, Web, http://www.chinasage.info/maps/hubei.htm.